If you’re looking for incredible Mexico islands to visit on your vacation, you’ll love this comprehensive list including islands near Puerto Vallarta. Beautiful beaches are one of the best things about a trip to Mexico, along with abundant marine life, scuba diving, and picturesque views — which is why traveling in this area is best enjoyed with excursions and day trips. You’ll be able to visit expansive coral reefs, natural reserves, and national parks, which are all near or on their own lush tropical island paradise not too far from the shores of Mexico. Don’t limit yourself to the amenities of the mainland, or you may miss out on the adventure of a lifetime. Along both coasts, you’ll find numerous islands, some of which are uninhabited, hidden, or home to various sea mammals, colorful coral, and aquatic creatures. Many can be easily accessed by boat from Cancun, Puerto Vallarta, Cabo, and other popular vacation spots. Check out our list of some of the best Mexico islands, and include some of these exciting destinations in your next vacation or romantic getaway. Please remember that most of these areas are preservation sites for precious marine wildlife, so be mindful of what you use or leave behind. You’ll also want to be sure you’ve packed a reef-safe biodegradable sunscreen that won’t damage the reefs, fish, or animals. If you plan to visit the western side of Mexico, you’ll find several beautiful bays and beaches, as well as island destinations worth exploring. Some of the most popular are islands near Puerto Vallarta, since the city is a hub of resorts and entertainment. 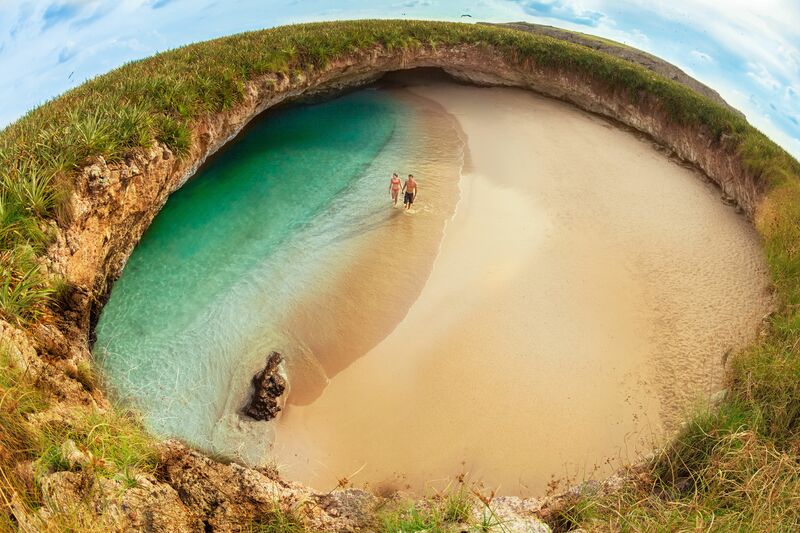 The Marietas Islands are located in the Bay of Banderas, and these beautiful islands near Puerto Vallarta are protected as a natural sanctuary as part of Marieta State Park. 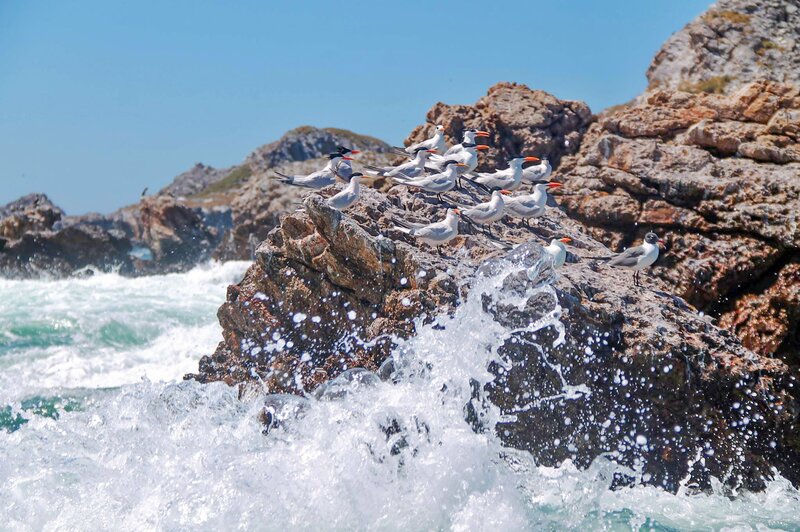 They are home to numerous species of wildlife and are a great place to experience pristine natural beauty, stunning landscapes, and ocean views. This is a great place to see dolphins playing, and in the winter it is common to see Humpback whales that come here for breeding. One of the best ways to visit the Islas Marietas without missing any incredible detail is to book a tour with an experienced company like Vallarta Adventures. Vallarta Adventures offers two different tour options for experiencing the wonders of the Marieta Islands in Mexico. The Marieta Islands Hidden Beach Tour is perfect for a romantic getaway, with a stop at the iconic “Lovers Beach.” It is also great for those seeking a unique experience swimming through cave formations and rock archways, spotting tropical birds, whales, and other land and sea life, and learning about the ecologically diverse sanctuary and preservation efforts in Marieta State Park. On the Islas Marietas Eco Discovery Tour you’ll get a chance to kayak, paddleboard, and snorkel in the clear water, as well as make a stop at Majahuitas Beach, which is exclusive to Vallarta Adventures tours. This small island is mainly visited for scuba diving, and divers have been known to spot giant manta rays, Galapagos sharks, whale sharks, and more. Aside from a small naval station, this island is uninhabited, unless you count the wildlife, like the numerous species of birds residing in the dense vegetation. The surface of this volcanic island is mostly rock, but the wild jungle areas look like something from a movie. Isla Socorro is the largest of the four islands that make up the Revillagigedo Archipelago. Isla Todos Santos is a pair of islands near Baja and is best known for surfing because the waves off the smallest island are the biggest in North America. The islands can be accessed by boat and visitors can spend the day with seals, sea lions, pelicans, and other surfers. Scuba divers can explore underwater gardens and caves. There are no amenities on the island aside from a couple of lighthouses, so bring along some food and water. Who doesn’t dream of sailing around the Caribbean, hopping from one gorgeous island to another? 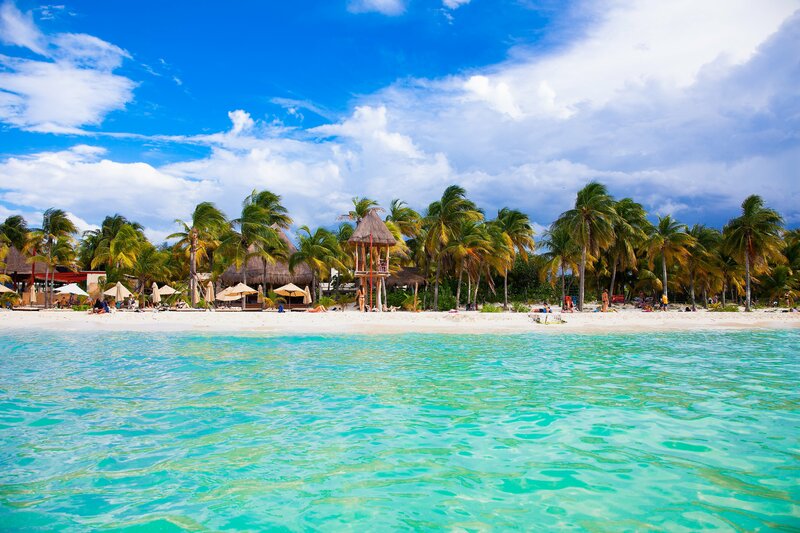 Make the dream a reality and schedule a stop at each of these enchanting Mexico islands for some rest and relaxation. Plus, you can throw in some spectacular scuba diving adventures and expand your education about ecological preservation efforts and how you can help. Isla Cozumel is Mexico’s largest island and is surrounded by the Mesoamerican Barrier Reef, making it a hot spot for scuba divers. This is also where you’ll find the underwater sculptures of the Museo Subacuático de Arte. It is located about 45 miles south of Cancun in the warm waters of the Caribbean. Isla Cozumel is a great place to find white sand beaches, great food, and bargain shopping, in addition to diving and bird watching. You can also swim in cenotes (natural fresh water sinkholes), rent ATVs to explore the island, and visit pearl and cocoa farms. Isla Contoy measures only five miles in length, and is practically unknown outside of Mexico — only 200 guests are allowed in each day! It is protected by the Mexican government and is now a national park and a sanctuary for approximately 152 tropical bird species and 4 different kinds of turtles. It’s ideal for simply relaxing on the beach, swimming in the lagoon, or enjoying some fresh local seafood. Those who wish to visit must apply for permission in the park offices in Cancun or Isla Mujeres. This undeveloped island off the tip of Quintana Roo is a laid-back beach paradise with sandy streets and restaurants lining the beaches. It’s so laid-back, in fact, that locals mainly get around using golf carts. One of the main attractions is the up-close view of enormous whale sharks coming to feed on plankton in the water. You might also see endangered sea turtles, flamingos, pelicans, and crocodiles. Isla Mujeres is a beloved island destination found just a few miles off the coast of Cancun. There is a variety of activities to enjoy, including shopping at local boutiques, tasting authentic cuisine, and even visiting some historical sites. Playa Norte, this Mexico island’s north beach, is the most popular place on Isla Mujeres for soaking up some sun or playing in the water. The surrounding coral reefs create great spots for scuba diving and snorkeling in the Caribbean, where you’ll see numerous types of sea life and coral. On the south side of the island are the ruins of a Mayan temple and a picturesque lighthouse. To book a tour for this breathtaking island experience, book with Cancun Adventures. This reef surrounds a group of islands just off the coast of the state of Yucatan, and is the largest reef in the southern Gulf of Mexico. It has been designated a national park, a Reserve of the Biosphere, and is part of the Campeche Bank archipelago. The five islands found near Scorpion Reef are Isla Pérez, Isla Pájaros, Isla Chica, Isla Desertora, and Isla Desterrada. These vegetated islands are mostly uninhabited but are a preservation grounds for several species of birds and marine turtles. You can snorkel around sunken boats as well as visit the one lighthouse on Isla Perez, which dates back to the 1800s. You’ll want to head out early, however, as it does take several hours to reach. You’ll also need to get a permit 30 days in advance. The Gulf of California is the perfect place for scuba diving, snorkeling, and exploration, so get scuba certified (which can be done through Vallarta Adventures while in Mexico) and pack your eco-friendly sunscreen. These incomparable reefs and island beaches will easily top your list of favorites. Also known as the Holy Spirit Island, this stunning locale is found in the Sea of Cortez, which Jacques Cousteau referred to as “the world’s aquarium” because of the abundance of colorful marine life you can find in the crystal waters. There are hundreds of species of fish and more than 25 species of marine mammals living in this area, so you are likely to spot manta rays, sea turtles, whale sharks, dolphins, and tropical fish if you go snorkeling or scuba diving. The rocky Los Islotes, to the north, is home to numerous sea lions. These cute creatures have become accustomed to tourists coming and going, and there is a good chance they will venture right up to your boat or swim alongside you in the water. Isla Espiritu Santo also has beautiful hiking trails, where you may see black-tailed jackrabbits, which are native to the island. Experience this unique island on a Sea of Cortez Snorkeling tour with Cabo Adventures. You can explore some of these Mexico islands by booking tours through Vallarta Adventures. We offer various private tours, group tours, and excursion packages for travelers of all skill and activity levels. Let our experts teach you everything you want to know about local culture, history, and wildlife as you discover the beauty of Mexico. You’ll also get to savor the authentic cuisine, as many of our tours include delicious meals prepared by local experts, and you’ll also get access to exclusive locations. Contact Vallarta Adventures today to learn more about the tours we offer and to make reservations for your next vacation! Don’t forget to ask for information about our scuba diving certifications, refreshers, and reactivations that can be completed in Mexico. We even have beginner scuba classes for kids. We look forward to seeing you in Vallarta soon! Create unforgettable memories in Puerto Vallarta by embarking on the adventure of a lifetime with our wide selection of world-class tours! Learn more about us, Subscribe to our newsletter below, or contact us for more infomation!